Today I went to visit my soon to be 5 year old sons class to see his portfolio. I arrived towards the end of the allowed time, thinking I would go in quickly and leave quickly to get home before bed time. Little did I know. I arrived and was given a ticket with the number 10 on it. The mother who was in the class at that point was number 5. Ok. Time to socialize! I sat with a group of mothers outside my child’s class room and got to know them and which children they belonged to. Outside the class they had some of the children’s work displayed and a wall with their pictures on it. When I glimpsed the wall I remembered that at the beginning of the year they asked us for photo’s of our little ones and that was the last I remembered about it till just now. Crap. I walked up to look at it and found that the teachers had taken the pictures themselves thankfully and hung them on the wall next to all the other children. You could immediately tell the pictures of the children that were taken at school as opposed to the ones that were sent in and there were at least 6 I could count so I had solace in the fact that I wasn’t the only mother to forget! It was nice getting to see the mothers of your children’s friends. When I was at school and I would ask my mother to go over to a new friends house her first question to me would be ‘who’s her mother?’. At that point I hated this question! I mean what 8 year old would have this conversation: 8 year old 1: will you come to my house this weekend? 8 year old 2: what day l? 8 year old 1: Thursday? 8 year old 2: Sure! Who’s your mother? I never for the life of me understood what that question meant! I thought it was a bit judgmental to tell you the truth! I didn’t understand what the mother had to do with my play date! Then I had children. The mother had a lot to do with it. It’s not about how people parent it’s more about the common sense and safety factors. And yes fine, little about how they parent if we are being honest. I wouldn’t send my child to someone’s house who thought it was funny when they said rude words for example. So the typical sizing up of mothers was happening. And then the exchange of number, or not, depending on how they liked me. I have to admit all the mothers I met were lovely and smart and I would gladly send my children to their houses. after chatting a bit I got up and looked at the children’s work that they displayed so beautifully outside the children’s classrooms. There were a series of papers hung up beside each other. Little posters the children had coloured with the words “World Best Mom” on them. They had made it look like a newspaper article with a space for the children to draw a portrait of their mother in it. At the bottom of the page they had sentences with spaces in them for the children to complete (or rather for the teacher to fill for them with the children’s words) here is the beautiful portrait B drew and the answers to the questions. ” She is so good at work… Work. Now at first glance I thought that was sweet. Then this feeling crept up inside me which wouldn’t go away. Good at WORK? 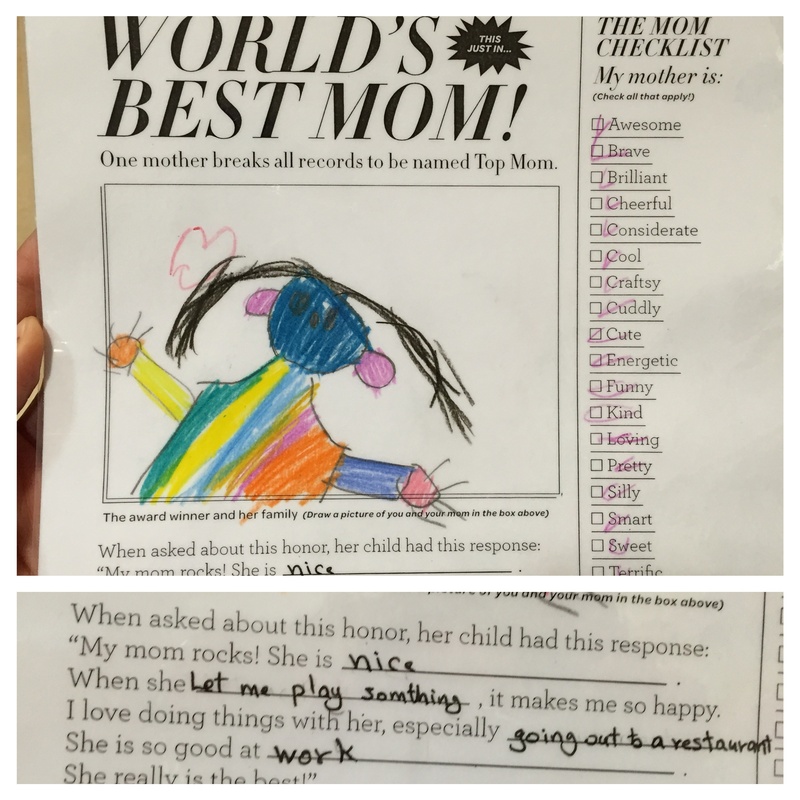 seriously… is that what I want to be known for my by 5 year old son? I looked to the left of my sons paper at what that child’s mother was good at: “She is good at wearing nice shoes”. So yay, mine is at least better than that one. But then I looked to the right and this mother was “Good at fixing toys”. I can’t beat that! She was one of the mothers I had met earlier and she was so nice and pretty and looked like fun and I’m sure her child thought she was better than chocolate cause she was good at fixing toys! I want to be good at fixing toys! Or playing games! or making up stories. I always make up stories and some are bedtime favourites but he thinks I’m good at work. I have tried to cut back on work and give them more time. And yes I hear you before you say it, I am setting a good example of hard work and commitment etc. But when I die do I want to be knows as being “good at work”. Yes I just jumped from a sentence my son wrote in KG1 to “when I die”. I realise the ridiculousness. But I want to be good at fixing toys damn it. well I have heard that kids are known for their honesty, I don’t think its a bad thing, it’s just probably how he views things. Lol he may not view it as a bad thing ! Im sure he doesnt! But I know that I dont want that to be the first thing my child thinks of when they ask him what in good at.